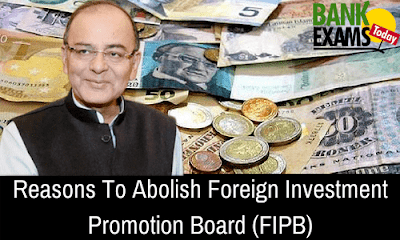 The Foreign Investment Promotion Board (FIPB) is nothing but a national agency of Government of India, with the duty to consider & recommend foreign direct investment (FDI) that doesn’t come back beneath the automated route. The Indian government in the budget 2017-18 announced its purpose of ending FIPB in the financial year 2018. The FIPB was primarily constituted under the Prime Minister's Office (PMO) in the wake of the economic liberalisation effort of the early 1990s. In 1996, the board was re-formed with the transfer of the FIPB to Department of Industrial Policy & Promotion (DIPP). Later, FIPB was transferred to Dept. of Economic Affairs & Ministry of Finance. Finance Minister is the head of the board. The FDI flows into India in two ways, the automatic route & through the approval by the government. Foreign Investment Promotion Board deals with a single window authorization mechanism for FDI applications in sectors under the approval route. The board has handled investment applications worth up to Rs. 5,000 Crore. Presently, about 90% of the Foreign Direct Investment inflows are channelled through the Automatic Route which does not require erstwhile approval from the FIPB & is subject to sectoral rules. For the rest of the FDI inflows (about 8% of the total FDI), every division concerned has a structure or a regulator for it. FIPB has successfully employed e-filling & online processing of foreign direct investment requests. Therefore, the government feels that it has now reached a stage where FIPB can be phased out.